My 1-2-3 Cents : The Voice? 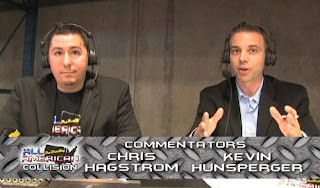 Many of you know that I do play-by-play for All American Pro Wrestling, a fast growing independent promotion in the southern Illinois, southeast Missouri, and western Kentucky area. We also reach parts of Tennessee and Indiana through WSIL TV, the ABC affiliate in the region. AAPW Collision is also seen world wide on YouTube and the company's first DVD release, "Main Event" is available for purchase still. 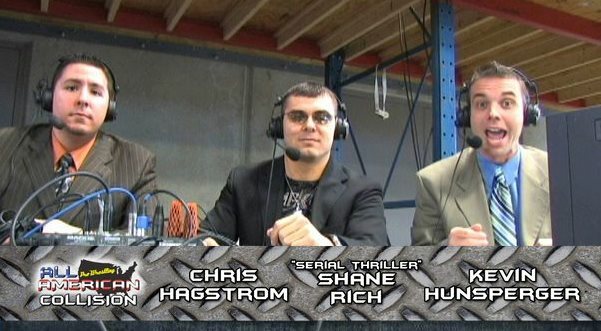 The reason I'm writing this post is because for as long as I can remember I wanted to be involved in the world of professional wrestling in some way. In my younger years I wanted to be a manager. I never really thought about the independent route back then. I wanted to be the next Bobby Heenan or Jimmy Hart and work for the WWF. As I got older, I knew that wouldn't be a reality. But right after I graduated from college I decided to send a resume to the WWF. They had no job listed at the time, but I was a naive 22 year old who thought why not? I actually got a rejection letter from them telling me that they didn't have any positions for me at the time, but they'd keep my resume on file and should something come open, they'd contact me. They never did. In 1999, after I had nearly two years of anchoring the news under my belt, I had the courage to apply for a ring announcer position with the company. 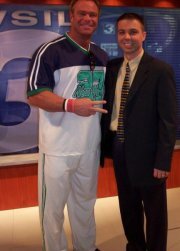 But I was greener than goose poop as Bill Demott would say. By the way, the person the WWE hired for that ring announcer post, Lillian Garcia. Obviously they made the right choice there. I knew I didn't really stand a chance, but it was that small glimmer of hope and that "what if" factor that was playing in the back of my mind. I had been doing some camera work for a small Indy fed in northwest Alabama at the time. It was fun, but because I'm terribly shy I didn't really take the opportunity to talk with the wrestlers and learn the business. Fast forward to 2005 and I had the opportunity to be a guest ring announcer for Ian Rotten's IWA: Midsouth when the company came to town. They were here three times total and I was the ring announcer for two of them. The birth of my daughter kept me away the third time. I also had a chance to be a referee for a couple of matches in 2010. I thought that would pretty much be it for me. 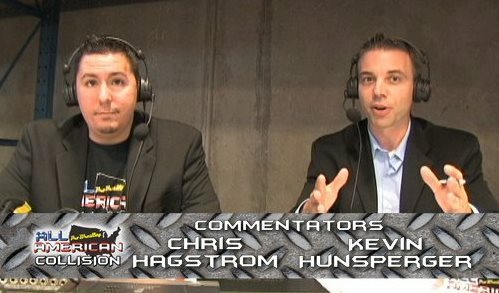 But then in the spring of 2011 I was approached to do play-by-play for AAPW. I know I'm still greener than goose poop, but I'm wanting to hone my skills and become better. Executive producer and my broadcast colleague Chris Hagstrom has referred to me as "the Voice of AAPW." It's an honor I don't take lightly. So that's where you guys come in. You're obviously a wrestling fan, or you wouldn't be reading this. Please take the opportunity to watch the YouTube clips below and give me your 1-2-3 Cents on my skills. If you don't want to post your opinions here, feel free to email me at kevinhunsperger@gmail.com. I have incredibly thick skin from years as a news anchor, so you're not going to offend me. Thanks for reading and for the input.